Valet parking is avaliable at the Sunset Entrance for $7. Seating begins at 6:30 p.m. and show begins at 8:00 p.m.
Live music and other events are featured throughout the week and after Flamenco shows. The details of these events can be found on our website. Flamenco shows are every Saturday and Sunday at 5:00 with seating beginning at 6:00pm, and ending at 8:00pm. Their are three available packages for our show. In celebration of the diverse flavors and spices of the Mediterranean, El Cid brings you El Oso, a California Mediterranean restaurant. El Oso seamlessly blends modern and old-world cooking techniques while showcasing some of California’s finest seasonal ingredients. From heirloom tomato Gazpacho to Catalan style short ribs to paella with fresh prawns, Chef Jason Fullilove adds a level of soulful creativity to these culinary classics. Choice of Soup or Salad, Choice of Entree & Dessert. Soup, Salad, Choice of tapa, Choice of entree & dessert. Preferred seating. Soup, Salad, choice of two tapas, choice of entree, dessert and a carafe of signature sangria. Made with raw tomato, cucumber, pepper, onion and some garlic, olive oil, wine vinegar, and salt; served cold. Baby Arugula, spinach, artichokes, onions, tomato, cucumber, romano cheese, apples and fire roasted bell peppers with a lemon vinaigrette. Spiced meatballs cooked in salsa roja. Spanish style potato wedges drizzled with house brava sauce. White fish cooked in lime juice served with avocado and chips. Sautéed shrimp tossed in our house roja sauce. Crostinis served with a fresh tomato and balsamic topping. Slow roasted ribs in BBQ sauce. Shrimp, mussels, clams, saffron rice, oven roasted tomatoes and fire roasted bell peppers. Grilled tenderloin served with mashed potatoes, zucchini and black pepper sauce. Oven Roasted Mahi Mahi with sautéed spinach, fried polenta and a garlic butter sauce. Pan Seared pork chop served with mashed potatoes, roasted green onions and an apple balsamic sauce. Chicken breast served with saffron and tomato based rice and roasted zucchini. Fettuccine pasta with a creamy sun-dried tomato pesto, pine nuts, parmesan cheese and butter. French vanilla ice cream with hot fudge. lousy parking...no valet, have to park in questionable lot with only 10 spaces. food good but service poor. no chocolate cake as promised and no mint for mojitos!!! high priced drinks. filthy bathrooms. first time celebrating friend's birthday who is a dancer...she enjoyed the dancers but balked at the high prices for food packages. The Flamenco dancers, singer and guitarist were outstanding! That is why we came, so we were pleasantly surprised that the food and the service were excellent as well!! Great show, low quality food. I was very excited about going here. I lived in Santa Fe, NM for years and love Flamenco. The show was pretty good so if you love Flamenco just go for that reason alone. The food was terrible. Really... terrible. And the service was ok. The service was by no means bad, it was just ok. Very rushed with the food. I had my 1st bite of salad when they brought the next dish. The place is really neat so just go for the dancing and ambience. You have to order the set menu. Sadly, I would not return unless I was going to see a band. I would definitely not recommend this restaurant to a friend. It was freezing inside until they closed the doors. Now and then they would open if someone walked in and out. The portions of the food was a joke and you didn't get a full entry. I took friends who just got married and they ordered Paella entry. They were never told that it was one dish for two people. It was a joke. They got one small plate for two. My dish was chicken. One very small mini size piece of chicken that was dry. You couldn't even see a side dish. a couple of small very small potatoes. My boyfriend ordered the Steak and there were no side dishes. The $200 we paid for four people was worth maybe $75. We love the place! We keep going back every few years, and sending our friends to it. Resumen el show estubo muy bien, Ameno e Instructivo pero la cena, si quieren hacer de EL CID un lugar de cocina Espanola, no estubo a la altura. Normalmente desde que se sirve el aperitivo hasta que se cene, no deberia pasar menos de 15 minutos y el mesero/a preguntar " Ya estan listos para cenar". Luego una esnsalada es normalmente un "conjunto de vegetales" ( al menos 3 diferentes) preparados y dispuetos con sazon y/o dressing. No solo Hojas enteras sin recortar. En Espana la comida se acompana SIEMPRE con pan. SIEMPRE !!!! Luego de Postre, habiendo tantos postres RICOS ofrecen CHURROS ?? ?, generalmente los churros se comen en el Desayuno o en la merienda, pero NO DE POSTRE. Que tal unas Natillas, Crema Catalana, Alguna fruta con Natas ?? Algo mas elegante y mas tipico. Un lugar de comida Espanol y no tiene Espresso. ??? Mi nombre es Gabriel Turiel, Nacido en Espana hace mas de 60 anos y regreso a Espana, almenos 1 vez al ano. Would bring someone in a heart beat. The ambiance was great, the show was amazing, and it's such a cool retro place with so much history. The place is an iconic landmark. We were late for the show, but enjoyed the food. The Tapas were better than the paella which was way to saucy. Service was very good and the drinks were made to order. Service and food was disappointing! Slow, wrong, not enough attention. I thought the atmosphere and food was great. However, I felt rushed. We completed a 4 course meal in just under an hour. There didn't seem to be a pause. As soon as one course was finished the next appeared. Also-- they were quick to close out the bill. We went to El Cid to see a musical show I'd heard about. We bought tickets online beforehand and went to the restaurant/venue not really knowing what to expect. I'm not sure if we went through the wrong entrance when we arrived, but it was difficult figuring out where to check in or where to sit. It's possible that this was because we arrived a little early. Anyway, once we seated ourselves and were able to order drinks and food before (and during) the show, we were very impressed with the food. We ordered several small plate dishes and everything was quite delicious and reasonably priced. The show was good, too! Overall, we had a good experience at El Cid and plan on going back to catch another show sometime soon. I loved the Flamenco Show! Very interactive. Would love if they brought guests up on stage. Love Assieh the performer, and all are great! Food is terrible. Dancing is not good. Show is overlong. Restaurant feels dirty. Avoid! Neighborhood gem! Came on my birthday for "belle book and candle". Fun show, great outdoor patio, enjoyed the tapas (octopus was tender!) Thanks El Cid for giving me one of the best birthdays Ive ever had! Disappointed with the quality of the entertainment, but enjoyed the nostalgic atmosphere of the place. The server was friendly and efficient. The food and drinks were good, but overpriced. Food is amazing. Actually better than any meal I've had in Spain! Truly authentic Mediterranean style preparation and flavorful. Kudos to the chef, he is incredible. The well trained service staff is courteous, attentive, and helpful. The highlight of the evening is the group of flaminco dancers and the maestro guitar musician. The performance is energetic, exciting and a pleasure to watch and listen to. We will definitely recommend El Cid to everyone we know and we will return with friends and family. Profound thanks to the director of entertainment and manager, Joey Bybee, for a job well done. The flamenco dancers where good, however the food was not great. I asked for the Paella and the rice was tasteless and it was not an entree side it look like a appetizer. The lamb meatballs were small and the lamb smell was overwhelming. They only had two to three items to choose from. Was our first time here with done Austrian guest. We had amazing time. We lived the show and the best thing that it wasn’t the clichè holiwood show. They sent away and wouldn’t accept the voucher because they were having a private party. They should have contact us and let us know so we wouldn’t waist our time. El Cid is awesome. I've been coming here for years. If you want to see some authentic flamenco and eat legit Spanish food, this is the place for you. The main draw was the performance. I was told not to expect much from the food, but it was surprisingly good! Limited menu selection and poor service were the reasons for my rating. I recommend parents to get a sitter; not a family friendly venue. Great new food selection. The sangria is good, the corkage is just $15. The flamenco show is phenomenal. This is a LA gem. The dinner promised soup and salad, 6 Tapas to share, and a desert to share. When seated I immediately tried to clean the food remains from a prior seating off the table. Needless to say the table was not cleaned. Earlier the waiter dropped off a menu which did not correspond with what was promised and what we purchased. There was only three Tapas to select from. After about seventeen minutes later he came back and asked us if we were ready to order. We were not because, once again the menu did not correspond with what we purchased. He took our drink order instead, we ordered Sangria. It arrived warm and had a layer of sentiments floating on top. It was horrible. My mother ordered lemonade. She never complains, it was so bad she could not drink it. My wife ordered a Diet Coke, it came in a 8 ounce glass filled with ice. She took two sips and the coke was gone. When the waiter finally came back to take our order, he explained our voucher was changed and we only had the option to order either a salad or soup (not both), one of the three Tapas and a separate entrée for each. The salad servings came out very inconsistent. The entrée was barely digestible, and desert was served finally as we were leaving without utensils. We had to go to the manager to request the bill. When the bill arrived, we were shocked. The horrible pitcher of Sangria was $30, the lemonade that was not consumed was over $5 along with the coke. But worst of all the had the nerve to add 20% ~$40 for a tip when the service, drinks and food was the worst we had experienced ever. During the entire evening, I looked around to see if our experience was an anomaly. Unfortunately, it appeared to be the norm. There were tables where the food requested was not even served until late in the performance and the table beside us never received their entrée so they just canceled. The table behind us left without notice (I assumed they were very displeased). The dancer were too old to be dancing and should retire. Service was slow. Food was average. Glad to use Travel Zoo discount. Not worth the full price. The entrance to the patio was not clean and the hole place was tired and messy. I wish I could be the owner of this place to turn it 360 degree. This place has soooooo much potential yet it’s sooooo poorly managed. We were the third ones into the restaurant and the last ones to be served a drink. We had to call on a waiter three times before someone actually asked what we wanted to drink and everyone else were drinking and even eating. The music was so low and the dancers while they talk you could not hear. They performed well but this place could do better. You could hear crickets outside while we were waiting, no music no drinks and quite dirty all over. I was very dissatisfied and more disappointed as it was my first time. Anyway here is my number if you want further feedback or ideas to turn the place around. My name is Jose Fernandez and my number is (818)720-9289. Love the live flamenco performances! The menu is limited, but the food is pretty delicious. I've seen other reviews complain about the speed of service: it's a dinner show, so naturally courses are spaced out more than a normal meal. A fun spot if you enjoy live music and dance. The food offering was weak. The show was very good. Was there to celebrate a friend's bday. There was three of us and all of us enjoyed this new experience. we came from the central valley, so we drove 2 hours just to visit this place. We enjoyed it. The food was ok, but was not impressed. Overall, i would recommend for the show. It was my first time going there. I had invited my dear friend that has just came to town for a visit. I reserved for 2 people and yet half the food served was a single item portion for 1 person. I had to complain to the waiter more than once to serve us the other portion. We did get the other portion after an apology each time. I was excited to go to this landmark restaurant and piece of L.A.'s Spanish history. The building is interesting with the tile art and many statues and objects and other-worldly cave-like feeling as you descend down the steps. Indeed the actual location is beautiful. But - wow - the food is quite awful. The gloppiest, mushiest and worst paella I have ever had. Thankfully - you only get a few spoonfuls of this horrible oatmeal-like paste that masquerades as paella - that is Spain's version of a "food of the gods. " Most of the appetizers were quite horrible as well - maybe that's why such small portions. Though - the empanadas were quite good - I wanted to like the food - so I will certainly give credit where credit is due. I knew the wait would be long - we waited 45 minutes till a waitperson first came to our table. That part was okay as we were there for the night and in no rush - only wish the food was decent. The cheesecake dessert was frozen -defrosted!! And - that was the largest portion of our meal. Then the bill came - being overcharged by $250. I kid you not. We had to speak to the waiter a few times to get our bill corrected. My family and I had a wonderful evening at El Cid. The venue is cozy and the food is delicious. I am looking forward to a return visit . Next time , I hope to sit at a balcony table. The show was great! Would of liked to see a little more interaction with the crowd. But it was fun to watch. Although i made reservations and when greeted we requested the $75.00 package our waiters were inattentive and did not offer the sangria that came with the package until i asked for it. The venue is great, has lots to see and the live band was also amazing. The only thing that really lacked was the waiters. Not very attentive. I was with out a drink for quite some time until i requested the sangria that came with our package. appetizers were delicious. Had a good time overall. just wish the waiters were more attentive. 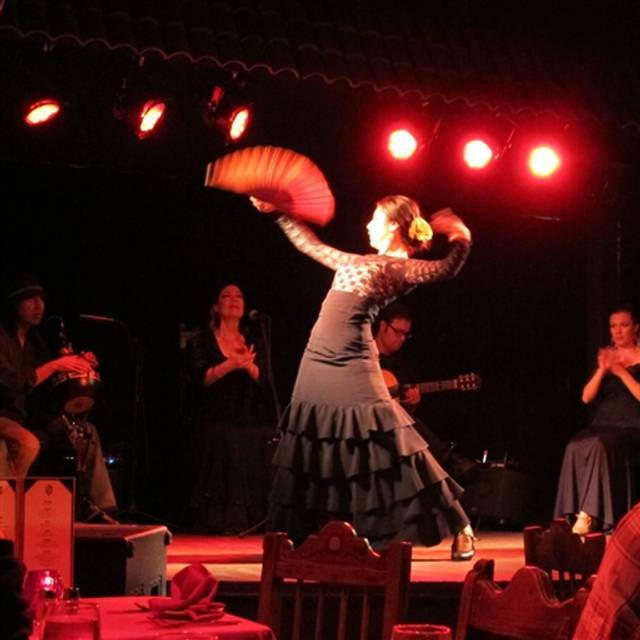 El Cid has a great festive atmosphere and wonderful Flamenco entertainment presented by dedicated and talented professionals with authentic costuming and music. The Spanish food complements the entertainment. The atmosphere is both festive and relaxing, and the experience is very enjoyable to share with friends and family or co-workers. I enjoyed learning a bit about the music and dance from the principal dancer.